Last week the USDA provided an update on net farm income estimates, including the first look at 2017. With this report, the USDA confirmed net farm income would be lower for the fourth consecutive year. However, the USDA’s latest estimates were not all bad news. This week’s blog post analyzes the latest USDA estimates and why conditions in 2017 are better than the outlook a year ago. At $62 billion (nominally), the USDA estimated 2017 net farm income 9% lower than 2016. The annual contraction alone, however, is not the largest cause for concern. Over the last four years, net farm income has fallen 50% since net farm income peaked at $123 billion in 2013. 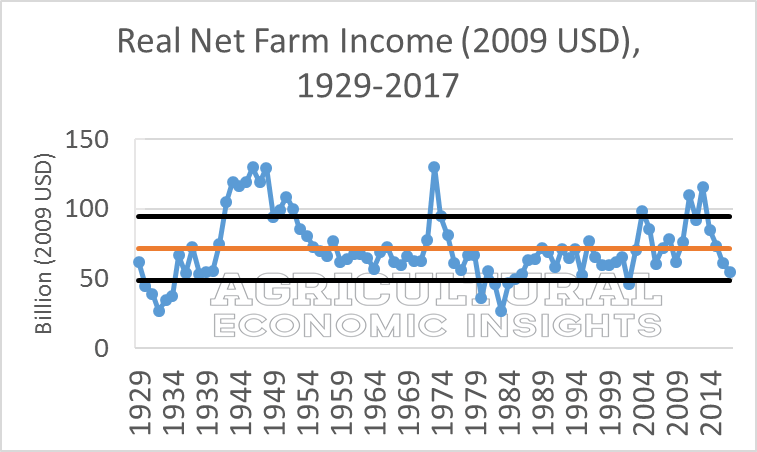 Taking a historic look at the USDA’s net farm income estimates provides context to current conditions. In figure 1, real, or inflation adjusted, net farm income from 1929 to 2017 is shown (2009 dollars). Graphed in orange is the average of real net farm income over the 89 years of data ($71.6 billion). Also on the graph, in black, is one standard deviation above or below the mean. Statistically, 68% of the data are between the black lines; or within +/- one standard deviation of the mean (+/- $22.9 billion of the mean of $71.6 billion). Most recently, net farm income peaked in 2013, well above the top black line. In fact, the recent boom in agriculture had several years near or above the top black line. For 2017, net farm income is forecasted well below the long-run mean and closing-in on one standard deviation below the mean- the threshold of historically low farm income in U.S. agriculture. In 2002, net farm income – in real terms – was lower than 2017. Figure 1. U.S. Total Real Net Farm Income, 1929 – 2017F. 2009 = 100. Data Sources: USDA’s ERS (Data accessed Feb. 2017). Current conditions are concerning, but it’s worth noting that conditions forecasted a year ago (in February 2016) were a bit more bleak than the most recent estimates. Shown in figure 2 was the USDA’s real net farm income estimates from 1929 to 2016 from February 2016. Note the estimates for 2015 and 2016 were nearly $50 billion, or approaching the lower black line. The USDA’s latest estimates have net farm income at $73.5 billion in 2015 – slightly above the long-run average – while 2016 is forecasted at $61.3 billion (figure 1). For production in 2015 and 2016, the USDA’s estimates improved during 2016 as farm income did not contract as quickly as previously thought. While the slide in net farm income is concerning and significant, the latest estimates are not as severe as thought just a year ago. Figure 2. 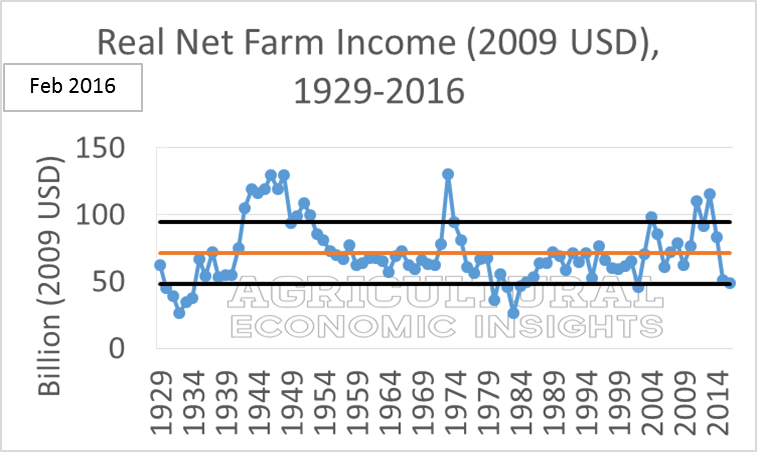 U.S. Total Real Net Farm Income, 1929 – 2016F. 2009 = 100. Data Sources: USDA’s ERS (Data accessed Feb. 2016). In addition to farm income, the USDA also provided updates on farm assets and debts. Table 1 highlights key changes. Total farm assets are expected to decline 1%, with farmland (real estate) slightly lower (<1%). Since 2013 – when net farm income peaked – total farm assets have increased 2% while real estate assets have increased 6%. Total farm debts are to increase 5% in 2017, with farmland (real estate) debt increasing 7%. Since 2013, debts have increased rapidly with total farm debts up 25% and farmland debts increasing 30%. Table 1. Changes in Net Farm Income, Farm Assets, and Farm Debts. 2017 vs. 2013 & 2017 vs. 2016. 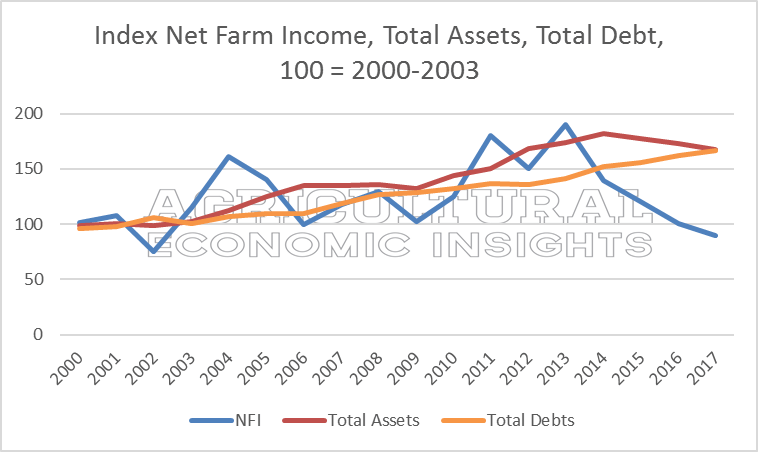 Figure 3 shows the trends in net farm income, total farm debts, and total farm assets from 2000 to 2017. More specifically, each of these measures have been indexed to show change for each category during the boom-era and the current margin squeeze (100 = 2000-2003). Indexed net farm income peaked in 2013 at 190 (or 190% of the average from 2000 to 2003), and is currently at 90. Total farm assets peaked in 2014 at 182 and have slowly adjusted lower to 167 in 2017. Finally, total debts have trended higher over the past 18 years and is currently at a high of 167. Figure 3. Indexed Net Farm Income, Total Farm Assets, and Total Farm Debts, 2000-2017. 100 = 2000-2003. Data Source: USDA’s ERS (access Feb. 2017). Brent evaluated key farm financial ratios earlier (here and here) and a future post will revisit these metrics in detail, but given the results in Table 1 and figure 3, it’s clear that most farm financial health measures are expected to deteriorate in 2017. For any business or sector, when 1) net incomes decrease, 2) assets trend lower and 3) debts increase, the impacts are not favorable to financial conditions. Just as conditions improved throughout 2016, conditions could also change throughout 2017. The most expected reason for net farm income to adjust is from changes in commodity prices. The current farm income estimate is sort of a budgeted scenario and, as many producers know well, budgets and reality can greatly differ from price and production (yield) differences. In 2016, much of the improvement in net farm income come from the USDA adjusting their estimate of farm capital consumption and capital expenditures. These estimates changed as farmers cut back on capital expenditures in 2015 by 26% and capital consumption – which is an economic depreciation measure –contracted. In short, these estimates are very helpful and useful, but are subject to revisions. Conditions in 2017 might change significantly as these estimates can, and do, significantly change – favorably and unfavorably. Initial estimates for net farm income in 2017 is a fourth year of contraction. The change over 2016 (9% lower) is not nearly as concerning at the 4-year contraction of 50%. Even though conditions are challenging, it is worth noting the USDA’s initial estimate for 2016 a year ago (in February 2016) were more bleak than current estimates. This speaks to the reality that the estimates for 2017 (and even 2016) could be subject to large changes over the next 12-18 months. In addition to declining net farm income, the USDA also projects rising farm debt and steady – to slightly lower – farm assets. Taken in combination, this marks a continued slide in the health of the farm financial sector an sets 2017 up as another challenging year for producers.